The trailer for this made me laugh a lot so I had to give the film a go. Am I the only one who finds it weird that this has come out pretty much the same time as the Simon Pegg film 'The Worlds End'? Titles just sound too similar to me. 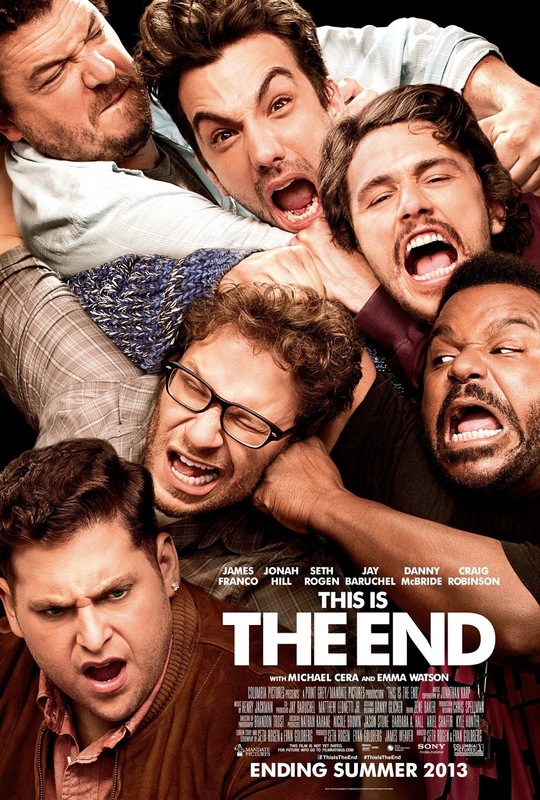 This is the End has a whole host of famous people playing exaggerated versions of themselves. Jay Baruchel is in L.A to visit old friend Seth Rogan who convinces him to go to a party at James Franco's new house. After heading out to buy some supplies Rogan and Baruchel experience cataclysmic events; earthquakes, fire, explosions, panic and people being beamed up into the sky. They rush back to the party just in time for a huge sink hole to open up and swallow most the guests. 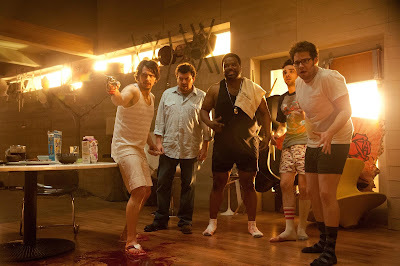 Thinking they may be facing the apocalypse the survivors; Baruchel, Rogan, Franco, Jonah Hill, and Craig Robinson barricade themselves in Franco's mansion and wait for rescue. As the days go on with no rescue the group start to realise that it may in fact be the real end of the world. 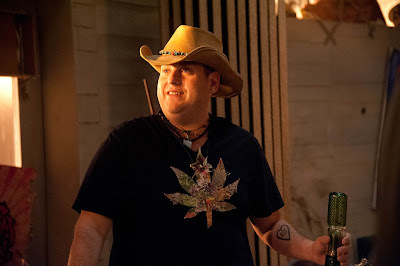 I was slightly worried that all the films best bits had been shown in the very funny trailer, but no, this film is consistently funny and laugh out loud funny at that. Around 50% of the film is apparently ad libbed which leads to some utterly hilarious lines. Most the humour comes from the dialogue which is liquid gold for nearly the entire running time. There is some low brow humour that is not really my thing but for the most part it works and has some fantastically placed dark humour as well as well as sight gags (using tape to tape up cracks that have appeared in the walls of the house for instance). There are a hell of a lot of cameos which unfortunately were lost for the most part on me as I only knew a handful of the actors due to not watching the right sort of films. For example Rhianna was in the film and I hate to admit I had no idea what she looked like, that shows the level of celebrity knowledge I have. Special mention has to go to Michael Cera who is portrayed as a coked up idiot, he was fantastic, so funny. There were quite a few people I recognised from other films, and of course Emma Watson (from the Harry Potter series) who had quite a funny role. For the most part the film take place in Franco's house and details the interactions between the core leads who are hilarious and each have a shed load of awesome one liners without coming across as trying to upstage each other. The group squabble over supplies, theories about what is happening (such as a zombie apocalypse or biblical Armageddon) and have plenty of talk about previous films they have done with there even being a sequel to Pineapple Express acted out and filmed by the bored group. Being a film about the end of the world brings with it some horror elements. The characters become so likable that I did come to be worried for them, I couldn't see how a good ending could be arrived at and so despite all the comedy there was a tinge of sadness to things. Though a lot of the film is set in the one house special effects are used to great effect when ever the outside is shown to display the raging hell hole the world has become. Some later scenes have genuine horror to them with nods to a variety of horror films. There are some quite bloody parts also, one great early scene had a severed head get into the house, the group all screaming and kicking it at each other in terror, so funny to watch. Every time you think things can't possibly get worse for the poor characters they somehow do, it's amazing how it just keeps ramping up and up right until the end. There is real evil outside the house, discovering what exactly is going on in the outside world is part of the hook for the films plot.